Dom Butgenbach - William Edward Lund Jr.
Lund’s unit was “alerted for employment in the Ardennes” area in eastern Belgium. The whole skirmish in the region would later come to be known as the Battle of the Bulge, a major German campaign on the Western Front. Early morning, the first major enemy offensive was “launched when 20 truckloads of enemy infantry detrucked 700 yards” from the southeast defensive line. Joining up with about 10 tanks, German troops attacked from the east and southeast. The defending battalions immediately called for concentrated artillery support in light of the armored tanks. For most of the day, both sides continuously traded artillery and mortar fire with hopes to weaken each other’s lines. The defensive strategy turned out to be superior and practically wiped out the entire enemy company. With few casualties, morale remained high as the motto reiterated the necessity of holding the area at all costs. 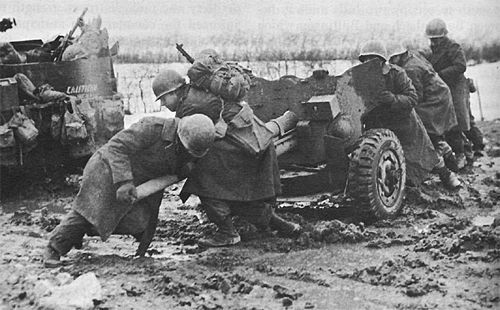 The 2nd Battalion setting up antitank guns that would prove to be critical through the defensive campaign. The Germans attempted to charge the line again early the following morning with “an estimated 20 tanks and a battalion of infantry” from the same directions. They were successful in disrupting communication lines between the battalions, but the defensive front lines were able to stand firm against heavy pressure. Any tanks that did make it past the line were baited and became great target practice for the antitank gunners. Expecting another attack, the battalions began placing antitank mines as a main line of resistance. Predictably, the enemy launched another small onset at sunset, but quickly pulled back due to supporting artillery from the defense. “The enemy put everything he had at his command.” German troops “laid down an intense concentration of artillery, mortar, tank and nebelwerfer fires which struck heavily on the battalion’s front line positions,” resulting in heavy casualties from direct hits on fox holes – Private Lund was one of the first men who perished that day, dying from a gunshot wound to the head in an exchange of small arms fire before the mortars hit. By sunrise, the battle had become more intense than at any point in the preceding days. Both sides received heavy blows as tanks knocked each other out and artillery drilled the terrain. The front line fought back with everything they had available, and by noon, several units began reporting that they had successfully repelled some of the attacks. Dom Butgenbach would continue to be secured by the Allies until January 15 when the 1st Division would launch a coordinated attack. Private Lund's approximate place of death.